Wax was selected to provide rigidity instead of a vegetable butter like Shea Butter or Mango Butter because wax tends to be more stable. It also lessens the chance that your solid perfume will fully melt if accidentally left in a very hot area. If you prefer, you can substitute a vegetable butter in place of the wax (or in place of some of the wax). If doing so, you may need to slightly adjust the amount of wax/butter and jojoba in order to achieve the rigidity that you desire. Vegan waxes like Bayberry may potentially work, but the wax to oil ratio may need to be adjusted to achieve the rigidity that you desire. A single essential oil can be used, or you may create and incorporate a blend of essential oils for incorporation into this recipe. AromaWeb's Aromatic Blending of Essential Oils Guide offers a helpful basis for creating beautiful, aromatic essential oil blends. When selecting essential oils to include in your solid perfume, be mindful of the safety precautions and contraindications for each oil and pay attention to essential oils that are more likely to cause sensitization or irritation. Avoid essential oils that are phototoxic. Carefully measure and gently melt your chosen wax and Jojoba together. A double boiler is recommended. When the wax has completely melted, remove the mixture from the heat and allow it to cool for a few moments, but don't allow it to solidify. Add your chosen essential oil(s) and stir well before pouring the mixture into your jars or tubes. Allow the containers to cool and harden completely before handling them. This recipe makes approximately 0.625 ounce of solid perfume that can be beautifully packaged in numerous ways. The photo shows the solid perfume packaged in small jars sold by From Nature With Love. Alternatively, the perfume can be packaged in tiny glass or plastic jars or tins. 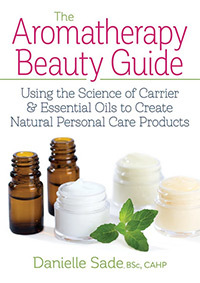 Refer to AromaWeb's Aromatherapy and Essential Oil Bottles/Packaging Directory for suppliers and sources of aromatherapy packaging. Dab a small amount of perfume onto your neck, behind your ears or on your wrists. Immediately discontinue use if you experience any discomfort or irritation. This solid perfume does not contain preservatives. Fluid fragrances are typically made using alcohol. Alcohol is somewhat anti-microbial. The beeswax and jojoba help to extend the shelf life of your natural solid perfume. For example,if you used more fragile vegetable oils and butters that have short shelf lives, the shelf life of your resulting perfume would be less than that when using waxes and jojoba. Because you can still potentially introduce bacteria into the perfume every time you swipe your finger into it, even with clean hands, I recommend that you make only enough to last you 1 month. Avoid storing your perfume in excessively hot environments as it may melt, leak, shorten the shelf life and/or alter the aroma of the perfume.